Amazingreen opens green and juicy with jungle fruit and leaves. It’s moist and sweet with what feels like a great deal of vitamin c oozing from every drop. It is fair to say that it is green, but not amazingly so, and the green-ness becomes more and more vague as it develops. The heart, in stark contrast to the juicy beginning, feels comparatively arid. Bitter ivy and warm herbs, tainted by a very faint, almost pale vetiver make for the most part of Amazingreen’s time on the skin and the underlying sweetness of the opening fades but never really dissipates. During my many samplings of Amazingreen I was really looking forward to the promised gunpowder and smoke accords, but much to my dismay at no point did either present themselves to me. There is a dash of something mineral-like, perhaps a smell closer to flint (which would be the Silex I believe), that does make an appearance towards the end, but the main theme of the dry down is musk, and lots of it. Despite the fact that Amazingreen is neither Amazing nor Green I can’t say that I hate it, it is in fact a very pleasant fragrance and I have worn it a couple of times, simply because it doesn’t really require input on my part to wear. It does smell good above all, but I definitely don’t love it and I think many Comme des Garçons fans, who are used to smelling something innovative and/or mind-blowing from the brand, are likely to be disappointed, after all “pleasant” isn’t what the die-hard fumenerds look for is it? 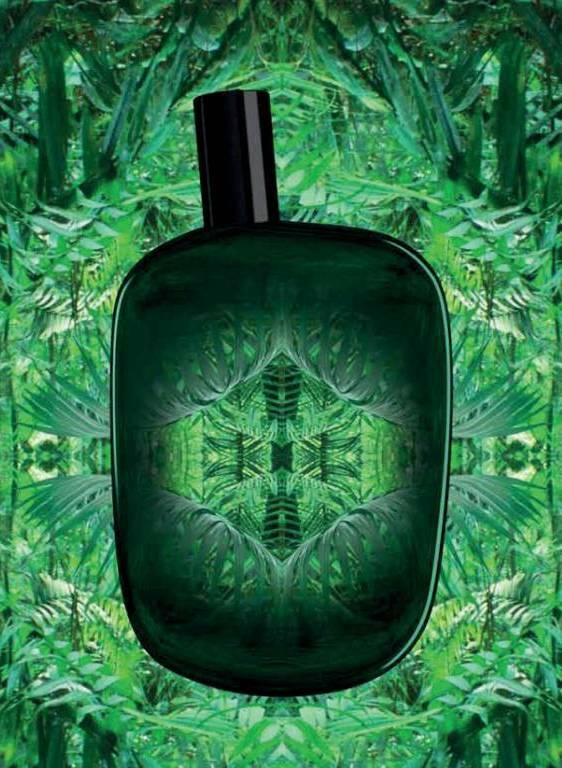 Amazingreen is available in 50ml and 100ml Eau de Parfum with prices ranging from £57-£75. Image 1 beautesse.at. Image 2 fubiz.net. Notes via Basenotes.net. Quotes via Escentual.com. Posted in Comme des Garçons, Green, Musk, Unisex and tagged Amazingreen, Comme des Garçons, Green, Musk, Perfume, Unisex. Bookmark the permalink. What a lovely review sir! I’m with you that “it’s not that easy being green” but I also have the same philosophy like you with never saying never. I’m always open to try something new for me – at least I won’t like it but I will know how did that taste/smell, right? 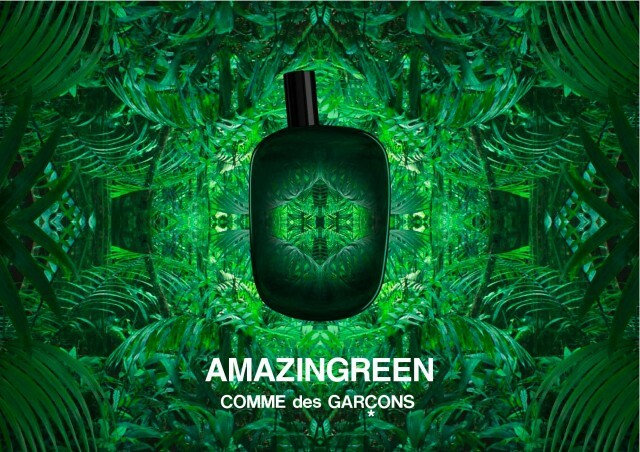 Since the beginning of my perfume journey I didn’t have much experience with Comme des Garcons line but I would like to try Amazingreen even when there’s a chance that I might not like it. Trying and deciding what you like and what you don’t help us to decide on our tastes. Never say never is definitely the way to go! Perfume should always be approached with an open mind, although I admit that it is difficult at times. Comme des Garçons is a good line to explore. I’d recommend 2, 2 Man and both the Incense and Synthetic series as a starting point. Amazingreen is definitely not the best of the bunch. “Trying and deciding what you like and what you don’t help us to decide on our tastes.” – Couldn’t have said it better myself! Kyoto is lovely! It’s a very warm, comfortable coffee and incense scent. Incense can sometimes leave you cold can’t it? Hehe and most of the incense series is pure church! Great review! Unlike your good self I am obsessed with green. I approached AG with due scepticism as obsession breeds a measure of particularity. While the house enthusiasm for linearity and synthetic stability has resulted some important perfumes, the main problem with Amazing Green is it’s failure to achieve the characteristic transitions which, for me, make naturally occurring verdancy so compelling. The last few releases from CDG have been underwhelming and somewhat under-powered. I haven’t been able to shake a suspicion that some of their shortcomings are the result of budget constraints on the authors. I completely agree, Amazingreen does not follow the path and development of a green fragrance at all. I think you may be on to something re budget constraints for sure. Ha ha! It’s not easy being green. I thought that too until this year when I gained a new appreciation of green scents. They need to be something special though and have some kind of twist for me to love them. All out bitterness is not good either. This one sounds like it’s not special enough and you’re right – just pleasant doesn’t cut it for people like us. Fun reading aobut it though! Exactly, relentless “green” is dull, it’s the twist and turns that make a good composition. We want so much more than nice! Although there is a time and a place for it I guess. Yes…that song’s going to be stuck in my head all day! Green fragrances fit into the second category for me. The Engineer loves them despite the fact it’s often a problematic note for me, so I spent several months last year exploring the category and found three I really enjoyed. The nice thing is when I read these kind of reviews, although I enjoy hearing about something new and I enjoyed your post, the lemmings are very, very silent. Sometimes a feeling of contentment is a great thing to have in this hobby. I envy your organised categories! Which were the three green scents that you really enjoyed? Silences, Heure Exquise, and Bel Respiro. I also fell for Le Temps d’une Fete, but it’s not green on my skin at all, so in my mind it’s a separate Spring floral category. Oh! I really hate it when things don’t live up to their name! I don’t mind a mind-twisting contradiction, but to call something Amazingreen and have it be neither amazing nor particularly green sounds like a loss of potential. There was a place downtown here called The Best Chocolate Cake in the World. First of all, their “cake” was more like a stack of crêpes with layers of chocolate cream sandwiched in-between. The chocolate wasn’t very chocolate-y either, more like chestnut with some cocoa powder. And overall, it was okay, but certainly wasn’t the best! I thought of that when I read your review. I was hoping for something really interesting, along the lines of CDG Harissa from the Red series. Oh, well. The Best Chocolate Cake in the World ended up changing their name to something as bland as their cake (so bland I can’t even remember what it is now). Doubtful that will happen to this after they launch it . . . I guess “The World’s Most Meh Chocolate Cake” doesn’t quite have the same ring to it 😛 But yes, I echo your sentiments entirely, if something is called “Amazingreen” you want it to be amazingly green or at least amazing AND green. This is neither. I did put a shout out on Twitter the other day about which Smell Bent scents were worth trying but only got a few responses, so it’s good to know where to start. Haha, Crapgreen is a good name, although I’m thinking of Mehgreen. Skai, Kyoto, even Avignon at times, not good!! But I loved the 2011 EDP release ❤ CDG do wierd good and bad. 2 Man is pretty good. It smells like snuffed out candles and spicy wood. Smells good on Nigel but I don’t really wear it. In fact that goes for most CDG things. I like and appreciate them but never wear them, perhaps they’re just not my style. Agree re the name. It just doesn’t fit the scent, unless they were trying to be ironic and witty, in which case they still failed. Ahaha, or succeeded becuase we noticed 😉 But nah – I think they believe it’s an amazing green. Just like they believe Skai smells like plastic… it does not. JCE has done some very good stuff! My poor immaturity, I’ll appreciate these one day I suppose – but don’t get me started on The Different Company though hahahaha! I think they regret sending me samples. They are all fragrances that really aren’t your “thing” and heck, I must say that he is the antithesis of the big, bold and lush perfumes I love but taken as compositions, with tastes aside, they really are very well done! I haven’t, I’d have to read them and get the mental image of his work out of my head to appreciate them I guess haha. Yep, not being much of a “greeny” myself – (tho’ I do LUV vetiver, which I suppose is “green”, but I digress … ) – I too was a little scared of trying Amazingreen. Still, being CDG I had to at least give it a chance, and actually was surprised to find that, like you, I didn’t actually hate it. I found it much more pleasant and wearable than I expected. But I too was disappointed with the lack of “smokyness/gunpowder” that I’d hoped would be it’s saving grace for me. And wasn’t too keen on the somewhat “toothpasty” beginning, which thankfully was fleeting. But otherwise yeah, I’d go with “Pleasantgreen” – & would probably wear it from time to time when in the mood for something fresh/uncomplicated, but only IF given a bottle. You’re starting to scare me now….. we’re on the same page again 😛 Hehe! Oops, guess what ? – I’m afraid I’ve made a bit of a boo-boo. 😦 … Due to a rather unfortunate mix-up with labelling on my samples, I’ve just discovered what I thought was a sample of Amazingreen, was in fact CdG’s Play series ‘Green’ instead. (Sorry !) … And whilst surprisingly most of what I said above actually still stands. (Apart from that “toothpasty” beginning I mentioned which is actually not the case with AG.) Now sniffing the real thing, I’m surprised to find that it’s actually much more ‘woody’ than actually ‘green’. I also now get the “gunpowder” note,not that it makes much of a difference. All in all, I’d say that I actually much prefer “Play/Green” than Amazingreen as a pleasant “green” fragrance. Oh no! I hate labelling mishaps! Yes I am with you on the being green. I want drama and excitment not a nap in the park. Wonderful review… I really enjoy reading your posts. Ha, nap in the park sums it up to a T! No wonder you were underwhelmed by this one – it is amazingly “reen” after all, not “green”. As for “elements of smoke and flint”, I can’t hear those words without conjuring up fabric swatches from Sofa.com. : – ) The best part of the perfume may in fact be the stunning visual, which I have now annexed as my pc wallpaper. The kaleidoscopic visual is pretty neat isn’t it?